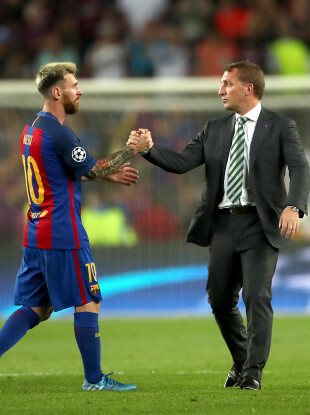 Brendan Rodgers saw his side ship seven goals against Barcelona last term. This time, they’ll face PSG in their first group fixture. BRENDAN RODGERS HAS joked that Celtic’s ambition for the Champions League this season will be to avoid a repeat of last season’s 7-0 opening-night loss. Celtic went to Camp Nou and were destroyed by a rampant Barcelona side, for whom Neymar was in particularly fine form. The Hoops will meet the Brazilian ace again on the first night of this season’s competition, though they will play host this time to Paris Saint-Germain, who spent €222 million on the 25-year-old. And with Bayern Munich and Anderlecht also in Group B, Celtic face an uphill task to reach the next round. When he was asked a supporters’ question and answer session what the aim for the European campaign is, Rodgers said: “Try not to lose the first game 7-0. We’re playing against 11 motorbikes, aren’t we? “But listen, I want us to be playing European football after Christmas, that’s the aim. Celtic equipped themselves admirably against stern opposition last term after that chastening loss, fighting back to draw twice against Manchester City and pick up a point against Borussia Monchengladbach on their way out of the competition. They start their campaign this season on September 12 against PSG at Celtic Park. Email “'Our Champions League aim? Not to lose the first game 7-0 - we're playing 11 motorbikes, aren't we?'”. Feedback on “'Our Champions League aim? Not to lose the first game 7-0 - we're playing 11 motorbikes, aren't we? '”.